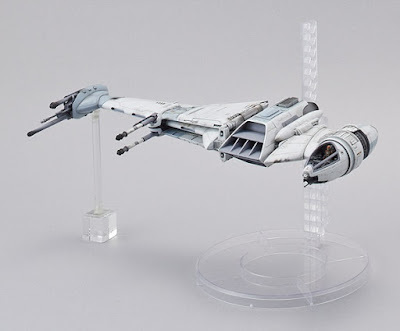 Anaheim, CA, June 26 – Bluefin, the leading North American distributor of toys, collectibles, and hobby merchandise from Japan and Asia, presents an impressive array of stunningly detailed and easy to assemble kits from Bandai Spirits Hobby that will be available for purchase during Comic-Con International 2018. A pair of Comic-Con exclusive kits also will be available. Comic-Con International is one of the nation’s largest comic book, science fiction, and pop culture events, and will take place July 19th–22nd, 2018 at the San Diego Convention Center, in San Diego, CA. Bluefin will be located in Booth #401. Complete details on Comic-Con are available at: comic-con.org. Comic-Con attendees will be the first to get their hands Standard Vegito for the first time in the world - even earlier than in Japan! The fusion between Goku and Vegeta to counter Majin Buu using the “Potara,” a sacred artifact of the Supreme Kai, is now available in a Figure-rise Standard edition. Boasting the widest range of any Figure-rise Standard kit, Vegito can achieve a multitude of poses recreating fan favorite scenes from the anime series! A substantial 17.7-inch Vegito sword is also included as well as an impaled Buu (2.5” tall) figure. by using forced perspective, one can arrange this kit to accurately mimic this memorable moment in the heat of battle! Comic-Con attendees will be the first to get their hands on the Figure-rise Standard Vegetto for the first time anywhere in the world - even earlier than in Japan! The fusion between Goku and Vegeta to counter Majin Buu using the “Potara,” a sacred artifact of the Supreme Kai, is now available in a Figure-rise Standard edition. Boasting the widest range of any Figure-rise Standard kit, Vegetto can achieve a multitude of poses recreating fan favorite scenes from the anime series! A substantial 17.7-inch Vegetto sword is also included as well as an impaled Buu (2.5” tall) figure. by using forced perspective, one can arrange this kit to accurately mimic this memorable moment in the heat of battle!